The calculation of these amounts is without question one of the most complicated calculations required under the Child Support Guidelines, but iGuideline's powerful features makes this calculation seem simple. iGuideline not only has the features to make this calculation simple and easy to do, it also has features to allow you to see how the calculations were reached. Combined, these features educate you about the process of obtaining correct calculations, and they also provide you with the confidence that the calculations obtained are correct. In this article I will go through the process of entering child care expenses, obtaining the correct calculation, and exploring how the calculation was reached. 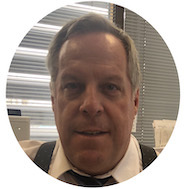 After that I will deal with the situation where a parent has a new spouse, and showcase iGuideline’s powerful features which allow you to easily obtain the correct calculation in those circumstances where the tax rules add a further level of complexity to the calculation. Before starting this discussion I want to clarify that the information contained in this article is not legal advice. WARNING: The information provided in the articles on this site is not intended to be use as legal advice, and is provided for informational purposes only. Only qualified lawyers can provide legal advice based on the lawyer knowing all of the circumstances of the person seeking advice. It is strongly recommended that all persons obtain legal advice from a qualified lawyer in their jurisdiction to help them determine their rights and responsibilities in relation to the receipt or payment of child support. With that important advice out of the way, let’s begin. This article assumes that you have some knowledge of how child support is calculated in Canada. If you don’t, I recommend that you read the Child Support Basics article. Alternatively, you can read the CHILD SUPPORT OVERVIEW section below. Lawyers and others who are knowledgeable about the Child Support Guidelines can skip this section if they wish and move directly to the EXAMPLE CALCULATION section below. The overall calculation of child support in sole custody situations is made up of two different calculations. One is the “Table Amount” that is calculated under Section 3 of the Guidelines and the other is a person’s proportionate share of the “net” Special and Extraordinary Expenses, which are calculated under Section 7 of the Guidelines which includes expenses like child care. In this tutorial we will not be discussing the “Table Amount”. Again, in this tutorial we will only be discussing the calculation of the “net” costs of child care expenses. (2) The guiding principle in determining the amount of an expense referred to in subsection (1) is that the expense is shared by the spouses in proportion to their respective incomes after deducting from the expense, the contribution, if any, from the child. (3) Subject to subsection (4), in determining the amount of an expense referred to in subsection (1), the court must take into account any subsidies, benefits or income tax deductions or credits relating to the expense, and any eligibility to claim a subsidy, benefit or income tax deduction or credit relating to the expense. William has employment income of $90,000 per year. Maria has employment income of $55,000 per year. They both Reside in Alberta. They have two children: Jacob, aged 5, and Olivia, aged 2. The children reside with Maria more than 60% of the time. Once the file is open we navigate to the Special Expenses view for Maria by clicking on the Special Expenses (Maria Tell) Button in the navigation area on the left side of the window. Within the main area of the window we see a Tab View Control near the top which allows users to view the different types of Section 7 Expenses. If the Child Care tab is not selected, please select it. The top portion of the view contains a table listing all the child care expenses that have been entered (which at this point is none) and the buttons to add and delete expenses. 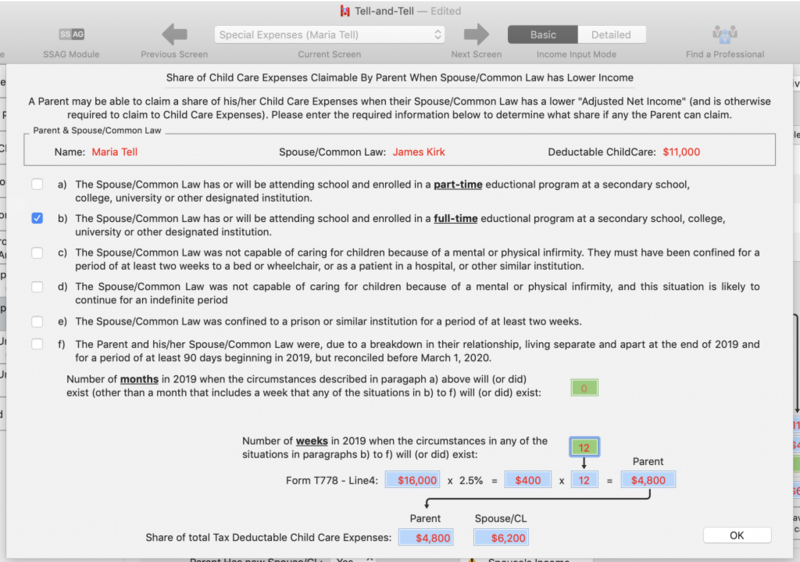 The bottom portion of the view shows Edit Fields that contain specifics of the total expenses, the allowable tax deduction for the Parent, as well as the different tax savings and increased benefits, on the left side, and finally a summary of the calculation of the “Net Child Care Expenses:” on the right side. This bottom portion helps educate and inform users, who are not familiar with the Guidelines that it is the “net” costs of child care expenses that are shared by the parents. The bottom part of the window also contains a Popup Button allowing the user to select whether or not the parent has a new spouse or common law partner. This significance of this will be discussed later in this tutorial. Before and after school care expenses of $5,000 for Jacob. We will add those expenses one at a time starting with the first expense for Olivia. Adding a child care expense is as easy as clicking the Add Expense Button below the Table. After doing so the expense is added with default information and displayed in the Table. The next step is to enter the specifics for the expense. First we select which child the expense is for, which is Olivia. Next what the expense is required for, which by default is the Parent’s Employment, which we will leave as set. Then we enter a description, which will be “Daycare Expenses”, and finally we enter the amount, $6,000. After the information is entered, the expense appears as follows in the Table. Displayed prominently under the “Is Tax Deductable” column is a yellow warning icon with an exclamation mark in it and the advice that the deductibility of the expenses has not yet been determined. This is the default setting for new expenses. 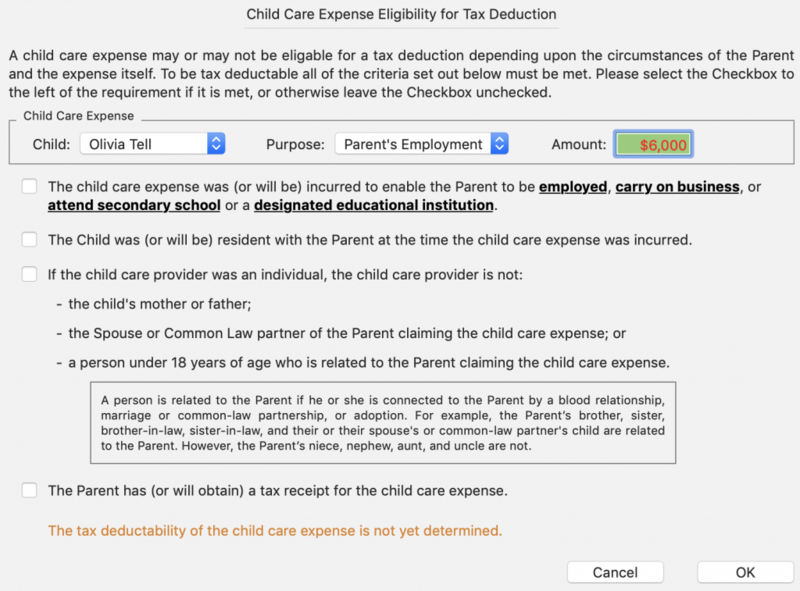 In this example the Child Care is tax deductible, so we just check the 4 Checkboxes and click the OK button to close the sheet, and once we do that we see that the icon in the “Is Tax Deductable” column is now a green circle with a checkmark in it with advice that “Yes” the expense is tax deductable. 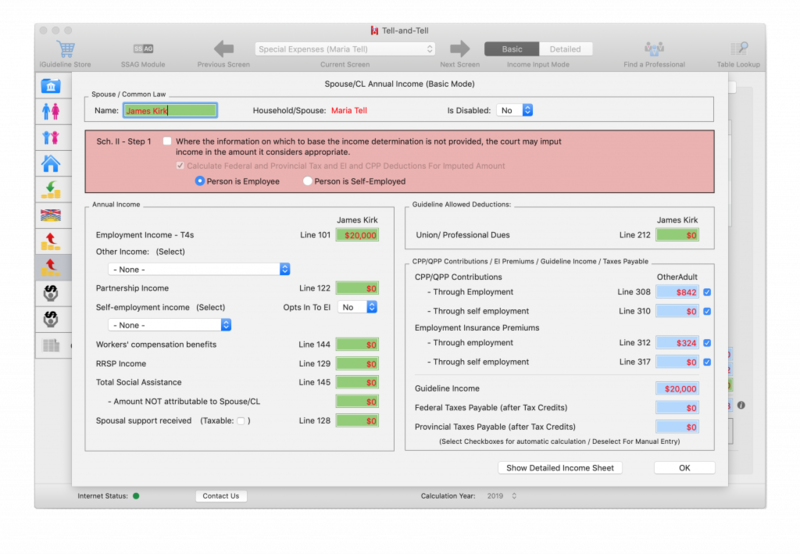 Next we add the second expense for Jacob, set the specifics of the expense, and display the Is Tax Deductable Sheet and check the Checkboxes to set this expense to also be tax deductable. 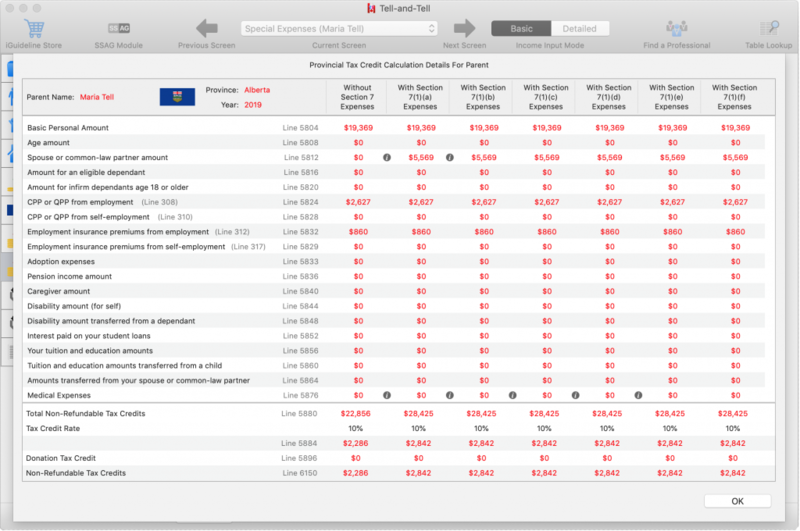 The result is that both expenses are now shown in the Table as Tax Deductable. 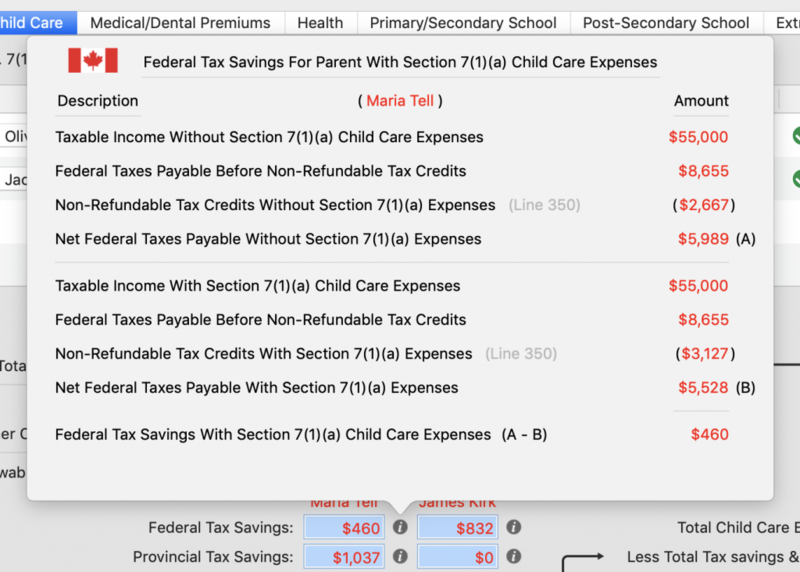 In the lower part of the view iGuideline automatically displays Maria’s allowable tax deduction for the child care, a summary of all the different tax savings and increased benefits she receives, and the resulting net costs of the child care expenses. In this instance the Federal tax savings are $2,055, the Provincial tax savings are $1,100, the increased Canada Child Benefits are $1,485, the increased GST Tax Credit is $550, and the increased Provincial Benefits are $440. This results in “net” child care costs of $5,370, which is less than half of what the gross costs are. Again, it is this net amount that get apportioned between the parents. To the right of the Text Fields showing those different tax savings and increased benefits are round Buttons (grey with a white “i” in the centre), called Show Details Buttons, that allow the user to display Popover Windows that show details of how those numbers are calculated. If those Buttons are not shown, select the View->Show Calculation Details Buttons Menu item. Clicking on the Show Details Button to the right of the Federal Tax Savings Text Field displays the Popover that shows how the federal tax savings of $2,055 are realized. In the top half of the Popover the net Federal Taxes Payable without the Section 7(1)(a) expenses calculation is shown, and in the bottom half of the Popover the net Federal Taxes Payable with the Section 7(1)(a) expenses calculation is shown. The difference of $2,055 (A-B) is then shown at the very bottom of the Popover. Reviewing the top half of the Popover shows that Maria’s Taxable Income without the Child Care expenses is $55,000, with a resulting taxes payable (before non-refundable tax credits) of $8,655. After the non-refundable tax credits of $4,477 are subtracted it leaves federal taxes of $4,178 payable. 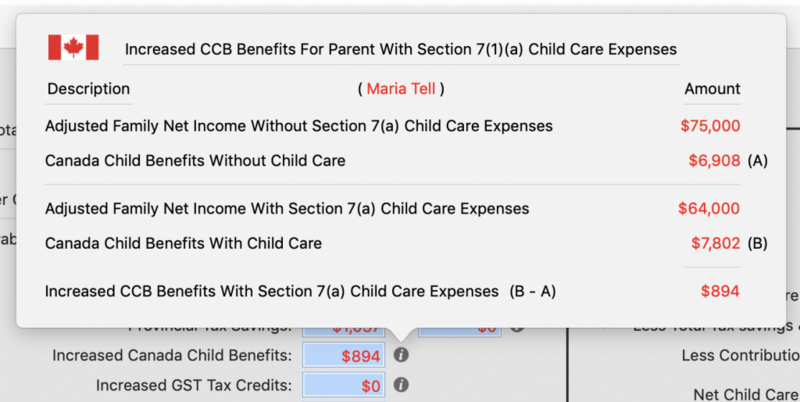 Reviewing the bottom half of the Popover shows that Maria’s Taxable Income with the Child Care expenses is $44,000, with a resulting taxes payable (before non-refundable tax credits) of $6,600. After the non-refundable tax credits of $4,477 are subtracted it leaves federal taxes of $2,123 payable. Finally, subtracting the difference ($4,178 – $2,123) yields the result of $2,055 in federal tax savings. Maria’s Taxable Income (Line 260 in her Tax Return) dropped from $55,000 to $44,000 because she is allowed to deduct the $11,000 in child care expenses on Line 214 of her Tax Return. 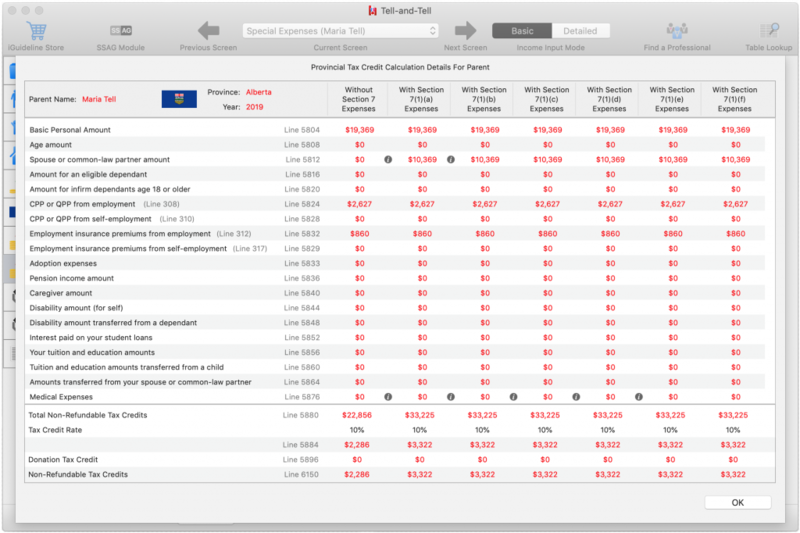 Clicking on the Show Details Button to the right of the Provincial Tax Savings Text Field displays the Popover that shows how the provincial tax savings of $1,100 are realized. Again, in the top half of the Popover the net Provincial Taxes Payable without the Section 7(1)(a) expenses calculation is shown, and in the bottom half of the Popover the net Provincial Taxes Payable with the Section 7(1)(a) expenses calculation is shown. The difference of $1,100 (A-B) is then shown at the very bottom of the Popover. Reviewing the top half of the Popover shows that Maria’s Taxable Income without the Child Care expenses is $55,000, with a resulting taxes payable (before non-refundable tax credits) of $5,500. After the non-refundable tax credits of $4,222 are subtracted it leaves provincial taxes of $1,278 payable. Reviewing the bottom half of the Popover shows that Maria’s Taxable Income with the Child Care expenses is $44,000, with a resulting taxes payable (before non-refundable tax credits) of $4,400. After the non-refundable tax credits of $4,222 are subtracted it leaves provincial taxes of $178 payable. Finally, subtracting the difference ($1,278 – $178) yields the result of $1,100 in provincial tax savings. 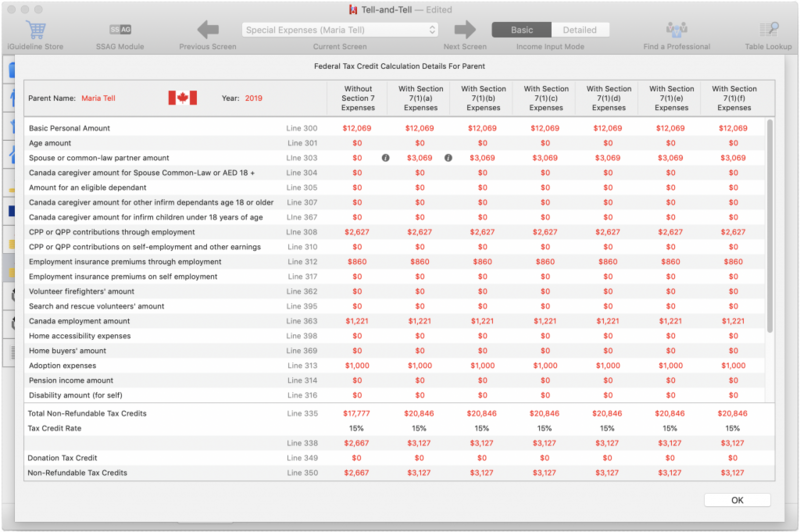 Clicking on the Show Details Button to the right of the Increased Canada Child Benefits Text Field displays the Popover that shows how increased Canada Child Benefits of $1,485 are realized. 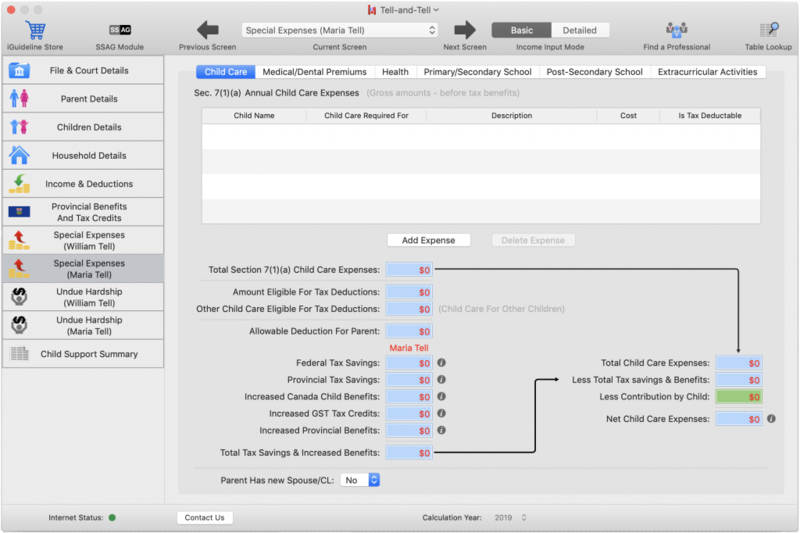 Following the same pattern as the tax savings Popovers, in the top half of the Popover the Canada Child Benefits without the Section 7(1)(a) expenses (Child Care) calculation is shown, and in the bottom half of the Popover the Canada Child Benefits with the Section 7(1)(a) expenses (Child Care) calculation is shown. The difference of $1,485 (B-A) is then shown at the very bottom of the Popover. Unlike taxes, which are calculated using a Parent’s Taxable Income, the calculation of the Canada Child Benefit is based on the Parent’s Adjusted Family Net Income. Reviewing the top half of the Popover shows that Maria’s Adjusted Family Net Income without the Child Care expenses is $55,000, with the resulting Canada Child Benefits being $9,017. 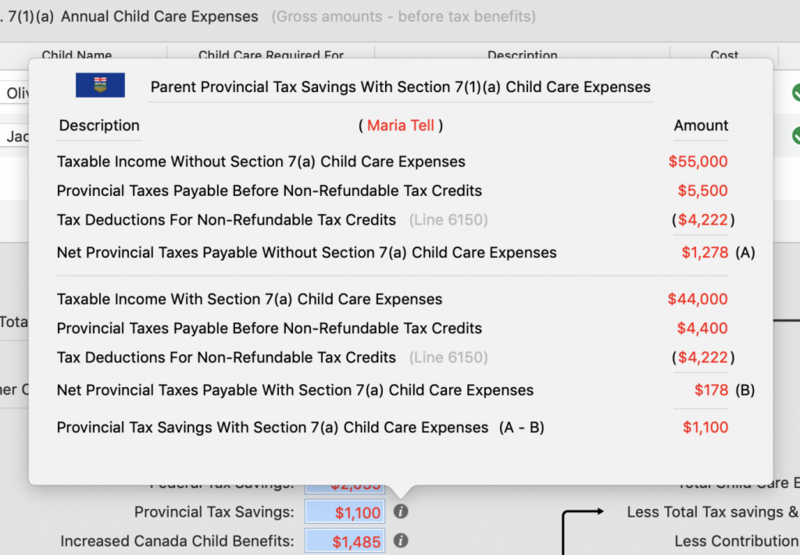 Reviewing the top half of the Popover shows that Maria’s Adjusted Family Net Income with the Child Care expenses is $44,000, with the resulting Canada Child Benefits being $10,502. Finally, subtracting the difference ($10,502 – $9,017) yields the result of $1,485 in increased Canada Child Benefits. By clicking on the Show Details Button to the right of the Text Fields for the increased GST Tax Credit and Increased Provincial Benefits one can view the details of how those values are reached, but in the interest of keeping this tutorial brief I will not do that here. What Happens When a Parent Has a New Spouse or Common Law? When a Parent has a new spouse / common law the calculation of “net” child care expenses under the Guidelines can become really complicated because of the tax rules which stipulate who can claim the expenses, but this is an area where iGuideline’s powerful features really shine and demonstrate why we at Orsa believe iGuideline is the most powerful child support calculator software available in Canada, on any platform. You or your spouse or common-law partner may have paid for someone to look after your child so one of you could earn employment or self-employment income, go to school, or conduct research in 2017. The expenses are deductible only if at some time in 2017 the child was under 16 years of age or had an impairment in physical or mental functions. Generally, only the spouse or common-law partner with the lower net income (even if it is zero) can claim these expenses. One of the things you may have noticed from the screen shots shown in this article is that there is a PopUpButton at the bottom of the Child Care tab view which allows one to choose whether or not the Parent has a new spouse / common law. While this control can also be found in the Household Details View, it is also included at the bottom of the Child Care tab view, because of how important this circumstance is in relation to the correct calculation of the net costs of child care expenses. We already know what the net child care expenses would be if Maria does not have a new spouse / common law, so we will now explore what happens if she does have a new spouse / common law. First select Yes using the Parent Has new Spouse/CL: PopUpButton, to indicate that Maria has a new spouse / common law. Doing this changes the user interface for the bottom half of the view significantly. There is a Parent Form T778 Button. There is, or course, one further significant change to the user interface; there are no longer any tax savings or increased benefits shown for the parent, or the new spouse / common Law. The answer is because the new spouse / common law, which has just been added, has no income, and the general rule is that the spouse with the lower income must claim the child care. In this case that is the new spouse / common law, and given the calculation in the Part B – Basic limit for child care expenses section of Form T778 (which iGuideline does) there is no allowable deduction for the $11,000 in child care expenses Maria has. Now we will add $20,000 of employment income for Maria’s new spouse / common law, who we will also name James Kirk. This is done by clicking the Spouse’s Income Button which will display a Sheet where the name and income can be entered. After entering the information we click the OK Button to dismiss the sheet. Increased Provincial Benefits of $440 for Maria. 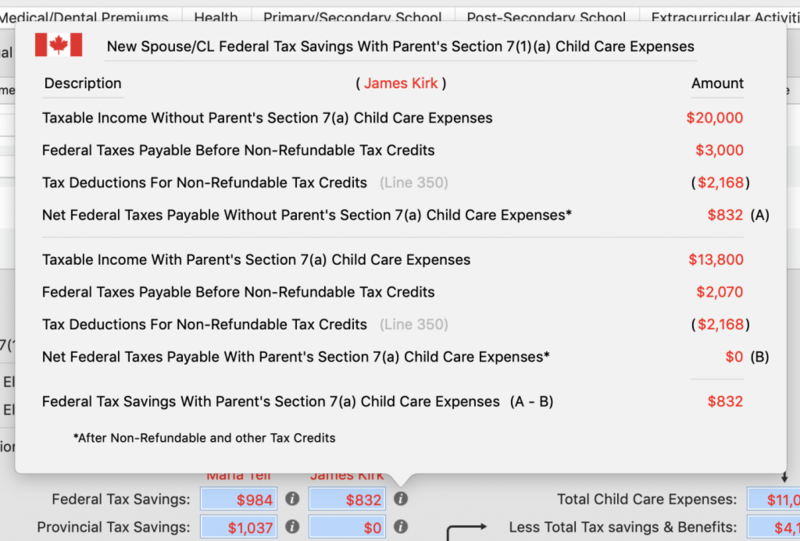 Clicking on the Show Details Button to the right of the Federal Tax Savings Text Field for James displays the Popover that shows how James’ federal tax savings of $832 are realized. In the top half of the Popover James’ net Federal Taxes Payable without the Section 7(1)(a) expenses calculation is shown, and in the bottom half of the Popover James’ net Federal Taxes Payable with the Section 7(1)(a) expenses calculation is shown. The difference of $832 (A – B) is then shown at the very bottom of the Popover. Reviewing the top half of the Popover shows that James’ Taxable Income without claiming Maria’s Child Care expenses is $20,000, with a resulting taxes payable (before non-refundable tax credits) of $3,000. After the non-refundable tax credits of $2,168 are subtracted it leaves federal taxes of $832 payable. 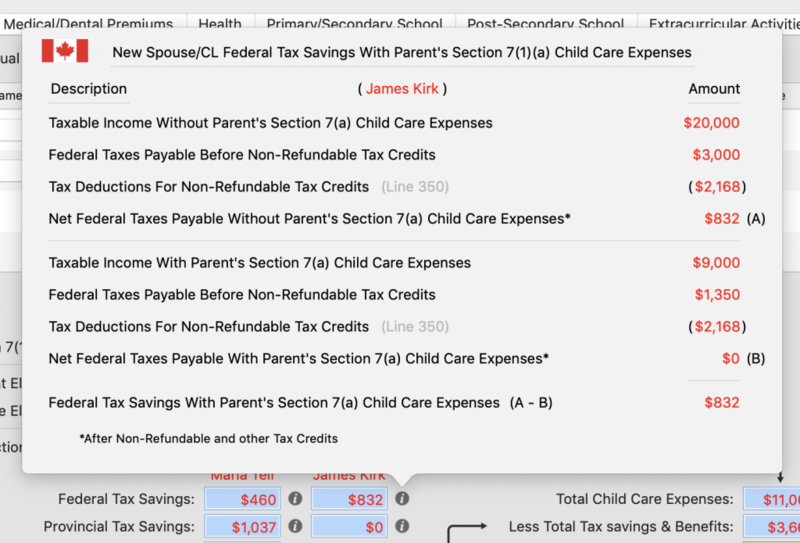 Reviewing the bottom half of the Popover shows that James’ Taxable Income with Maria’s Child Care expenses is $9,000, with a resulting taxes payable (before non-refundable tax credits) of $1,350. After the non-refundable tax credits of $2,168 are subtracted James pays no federal taxes. Finally, subtracting the difference ($832 – $0) yields the result of $832 in federal tax savings for James. James’ Taxable Income (Line 260 in his Tax Return) dropped from $20,000 to $9,000 because he is allowed to deduct Maria’ $11,000 in child care expenses on Line 214 of his Tax Return. Should James’ Federal Tax Savings Be Considered In the Calculation of Maria’s Net Child Care Expenses? This is an interesting question, and I have not found any decided Court cases where that issue was considered. A closer look at the language of Section 7(3) of the Guidelines shows that the word parent does not appear anywhere in that section. If that word was included in the language of the section, it would support an argument that it is only the parent’s tax savings and increased benefits that should be taken into consideration. It would be an odd result (and arguably an unjust one) where William is paying for a portion of Maria’s child care expenses, which resulted in Maria’ new partner James realizing tax savings without those savings being taken into consideration in the calculation of the “net” costs of the child care expenses. As before, clicking on the Show Details Button to the right of the Federal Tax Savings Text Field for Maria displays the Popover that shows how Maria’s Federal Tax Savings of $460 is realized. This is where things get a little interesting, and iGuideline’s powerful features start to shine. In this instance Maria’s Taxable Income is the same, $55,000, with and without the Child Care because the child care is being claimed and deducted by James. This results in the same amount of federal taxes being payable before non-refundable tax credits are considered, but upon a review of the Popover one can see that without the child care expenses Maria’s non-refundable tax credits are $2,667, resulting in net Federal taxes payable of $5,989, and with the child care expenses Maria’s non-refundable tax credits are higher, $3,127, resulting in net federal taxes payable of $5,528, and the federal tax savings of $460. Why are the tax credits different? Is this right? 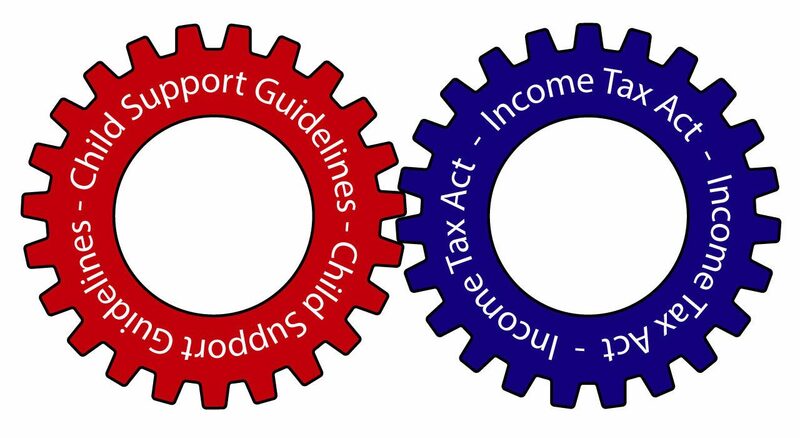 The answer to the second question is yes, and with the release of Version 2019.1.0, iGuideline now gives users the ability to view the calculation details of Parent’s Federal and Provincial Tax Credits in a sheet, which will allow us to find out which tax credit(s) are responsible for the difference. There are the familiar Show Details Buttons next to these amounts that then allow one to view the details of the calculation of the Line 303 amount with and without the child care. In this instance it was a simple calculation of subtracting James’ net income of $20,000 from the Base Amount of $12,069, which results of the value of $0. As we can see, James’ net Income when he is claiming Maria’s $11,000 in Child Care expenses is reduced to $9,000, and this results in Maria’s Line 303 amount being $3,069. The lesson to be learned here is that the calculation of some tax credits for a parent can change even when a tax deduction for the parent’s child care expenses is claimed by their new spouse / common law. iGuideline does all the work for you, and lets you see how the result was obtained. With our review of those numbers complete, we can now close the Federal Tax Credit Calculation Details Sheet by clicking on the OK Button. 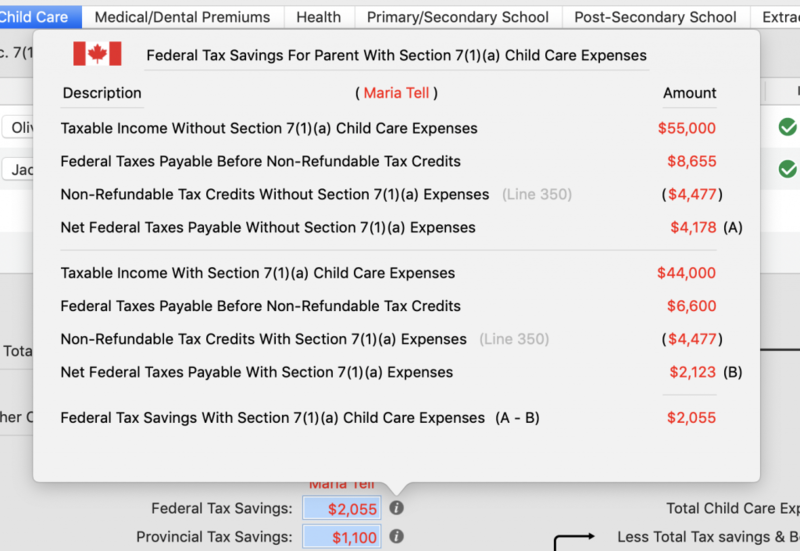 Similar to the Federal Tax Savings, clicking on the Show Details Button to the right of the Provincial Tax Savings Text Field displays the Popover that shows how Maria’s provincial tax savings of $1,037 are realized. Again, in this instance Maria’s Taxable Income is the same, $55,000, with and without the Child Care because the Child Care is being claimed by James. And again this results in the same amount of provincial taxes being payable before non-refundable tax credits, but upon a review of the Popover one can see that without the child care Maria’s non-refundable tax credits are $2,286, resulting in net Provincial taxes payable of $3,214, and with the child care Maria’s non-refundable tax credits are higher, $3,322, resulting in net provincial taxes payable of $2,178, and the provincial tax savings of $1,037. At the bottom of the Without Section 7 Expenses and With Section 7(1)(a) Expenses columns you can see the Line 6150 totals of $2,286 and $3,322 that appeared in the Popover. Looking through those same columns one can see that there is a different amount for the Line 5812 spouse / common law tax credit, with the allowable tax credit without Section 7 Expenses being $0 and with the Section 7(1)(a) Child Care Expenses the tax credit amount is $10,369. Again, there are the familiar Show Details Buttons next to these amounts that allow one to view the details of the calculation of the Line 5812 amount with and without the child care. In this instance it was a simple calculation of subtracting James’ net income of $20,000 from the Base Amount of $19,369, which results of the value of $0. As we can see, James’s “Net Income” when he is claiming Maria’s $11,000 in child care expenses is reduced to $9,000, and this results in Maria’s Line 5812 amount being $10,369. This is another example of where a tax credit for a parent changed even when a tax deduction for the parent’s child care expenses is claimed by their new spouse / common law, with iGuideline doing all the work needed to determine the amount. With our review of those numbers complete, we can now close the Provincial Tax Credit Calculation Details Sheet by clicking on the OK Button. 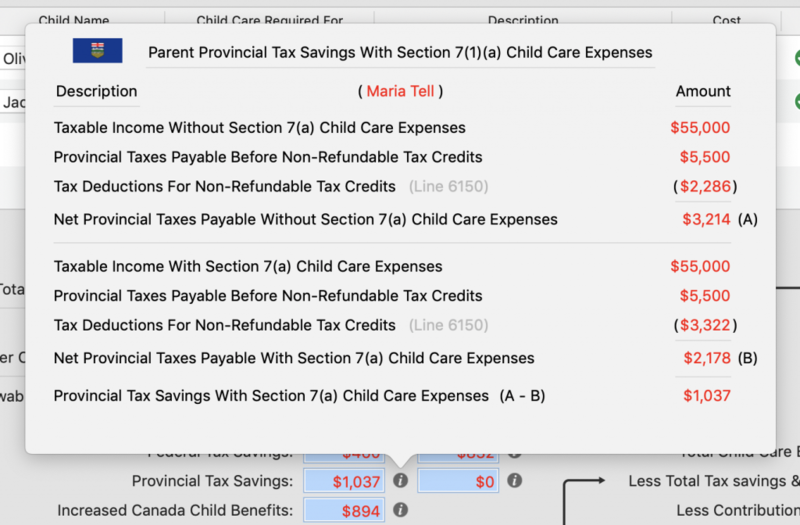 Clicking on the Show Details Button to the right of the Increased Canada Child Benefits Text Field displays the Popover that shows how Maria’s increased Canada Child Benefits of $894 are realized. 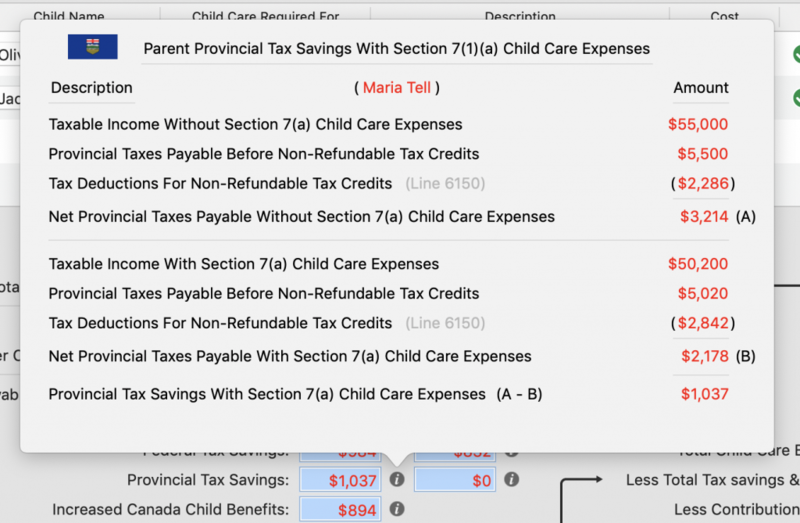 In the top half of the Popover Maria’s Canada Child Benefits without the Section 7(1)(a) expenses calculation are shown, and in the bottom half of the Popover Maria’s Canada Child Benefits with the Section 7(1)(a) expenses calculation is shown. The difference of $894 (B-A) is then shown at the very bottom of the Popover. Reviewing the top half of the Popover shows that Maria’s Adjusted Family Net Income without her child care expenses being claimed is $75,000, which is the result of adding her and James’ net incomes ($55,000 + $20,000 = $75,000), which results in Canada Child Benefits of $6,908. Reviewing the bottom half of the Popover shows that Maria’s Adjusted Family Net Income with her child care expenses being claimed is $64,000, which is the result of adding her and James’ net incomes ($55,000 + $9,000 = $64,000), which results in Canada Child Benefits of $7,802. The result is the increased Canada Child Benefits of $894. The lesson to be learned here is that a parent may still have increased benefits even when their child care expenses are being claimed as a tax deduction by their new spouse / common law. Again, iGuideline does all the work for you, and lets you see how the result was obtained. Clicking on the Show Details Button to the right of the Text Field for the Increased Provincial Benefits one can view the details of how those values are reached, but in the interest of keeping this tutorial brief we will not do that here. As we can see from the above example, even when a parent has a new spouse / common law who claims the parent’s child care expenses there can be tax savings as well as increased benefits for the parent, which need to be taken into account in the calculation of the net cost of child care expenses calculation. In addition, there can be tax savings realized by the parent’s new spouse / common law that also need to be taken into account in the calculation of the net costs of child care expenses calculation. The author is aware that some software does not calculate any tax savings or increased benefits in circumstances where a parent has a new spouse / common law who is claiming the parent’s child care expenses. We at Orsa Software Inc. think this is wrong, and we feel the numbers speak for themselves. If you have access to other software and are curious about whether it calculates these amounts, do a quick calculation to find out. The new Spouse / Common Law attended school and was enrolled in a part-time or full-time educational program. The new Spouse / Common Law was not capable of caring for children because of a mental or physical infirmity. The new Spouse / Common Law was confined to a prison or similar institution. Once the Sheet is displayed the user can enter the details for any of the circumstances in Part C of Form T778 that exist, or are expected to exist, during the year. 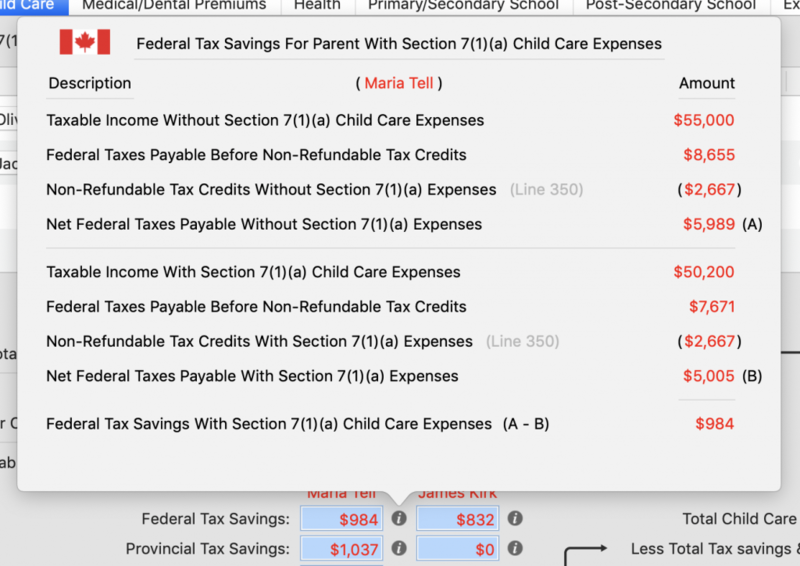 Clicking on the OK Button closes the Sheet, and we can now see that both Maria and James have the various tax savings and increased benefits that are shown in the bottom half of the view. With the allowable tax deduction for Maria’s child care expenses now being split between Maria and James on a $4,800/$6,200 basis, the tax savings and increased benefits realized are similar to when James was claiming all the child care with the exception that Maria’s federal tax savings are now $984, which is up from $460 when James was claiming all of Maria’s child care expenses. James’ Federal Tax Savings of $832 are still realized by the difference in his Taxable Income, which without any of Maria’s child care expenses is $20,000, resulting in federal taxes (before non-refundable tax credits) of $3,000. After the non-refundable tax credits of $2,168 are subtracted his federal taxes are $832. James’ Taxable Income with $6,200 of Maria’s Child Care expense is $13,800, resulting in federal taxes (before non-refundable tax credits), of $2,070. After the same non-refundable tax credits of $2,168 are subtracted his federal taxes are $0. James’ federal tax savings are ultimately limited by the fact that the federal taxes payable by James without any of the Child Care expenses were only $832 in the first instance. Maria’s’ federal tax savings of $984 are realized by the difference in her Taxable Income, which without any of her Child Care expenses is $55,000, resulting in federal taxes (before non-refundable tax credits) of $8,655. After the non-refundable tax credits of $2,667 are subtracted her federal taxes are $5,989. With $6,200 of her Child Care expenses being claimed, Maria’s Taxable Income is $50,200, resulting in federal taxes (before non-refundable tax credits) of $7,671. The tax credits are the same, $2,667, so the resulting Federal Tax Savings are $984. The interesting thing about this result is that although the provincial tax savings realized by Maria are the same as when James was claiming all her child care expenses ($1,037), how those provincial tax savings are realized is different. Firstly there are tax savings realized by the fact that Maria’s Taxable Income without the $6,200 in child care expenses is $55,000, resulting in provincial taxes payable (before non-refundable tax credits) of $5,500, and with Maria claiming the $6,200 in child care expenses her Taxable Income is $50,200, resulting in provincial taxes payable (before non-refundable tax credits) of $5,020. So there is $480 in provincial tax savings realized this way ($5,500 – $5,020 = $480). In addition to this, Maria’s non-refundable tax credits without the child care expenses are $2,286, and with Maria’s child care expenses Maria’s non-refundable tax credits are $2,842. So there is an additional $556 in tax savings realized this way ($2,842 – $2,286 = $556). So the overall tax savings are the $1,037 shown in the Popover ($480 + $556 = $1,037). The $1 difference when adding these numbers is the result of rounding. At the bottom of the Without Section 7 Expenses and With Section 7(1)(a) Expenses columns you can see the Line 6150 totals of $2,286 and $2,842 that appeared in the Popover. Looking through those same columns one can see that there is a different amount for the Line 5812 spouse / common law tax credit, with the allowable tax credit without Section 7 Expenses being $0 and with the Section 7(1)(a) Child Care Expenses the tax credit amount is $5,569. Within this article we have seen how complicated the calculation of the net costs of child care can be, especially when a parent has a new spouse / common law who earns less money, and how iGuideline can be used to make this calculation simple and easy to do. We’ve also seen how iGuideline’s powerful features can also be used to see how those results were obtained, providing you with the confidence that the calculation obtained is correct. That concludes this article. I hope you have found the information helpful. To experience iGuideline yourself, you can download the App for free from the Mac App Store and create a Sample File to start exploring iGuideline’s many features. When you decide you want to do your own calculation you can make an In-App Purchase which allows you to do your own calculation for as little as $19.99.